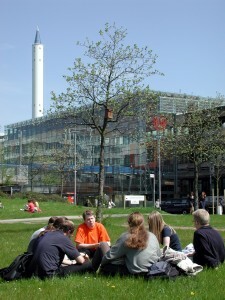 Dickinson’s host institution in Germany, the University of Bremen, is a mid-sized university with 17,000 students, offering 100 different degree programs organized in 30 academic disciplines. These cover a wide spectrum of subjects in the humanities and social sciences as well as in the natural and engineering sciences. Among many other fields, the university is especially recognized for its Social Sciences, Political Studies, European Studies, Geosciences, Ocean and Climate Research, Materials Science, Health Science, and Logistics programs. The University of Bremen was founded in 1971 and soon earned the label “Bremen Model” for its innovative principles, some of which have now become standard features of modern universities. These include: interdisciplinarity, research-based learning in projects, and social commitment. With more than 400 international cooperations and currently about 260 university partnerships worldwide, the Uni Bremen continues to expand its global orientation and advance its ongoing internationalization process. The University of Bremen is a campus university, located in Bremen’s Horn-Lehe quarter. The central boulevard connects all major institutions and buildings: the library, lecture halls, cafeteria, sport venues, auditorium, and the administrative buildings. Small shops, cafes, and the tram stop add to the lively atmosphere of the central area of the university. The remaining campus is dominated by student dorms, knowledge-based companies working in fields like engineering, information technology, and aeronautics and space), plus world-renowned institutes like Frauenhofer Institute and a branch of the European Space Agency (ESA). For many years now, the University of Bremen has been in the top league of German research universities. In 2012 the university won the prestigious title “Excellence University” during a very competitive application process at the Federal Ministry of Education. It has hence entered the exclusive club of only eleven German universities considered to be elite universities.